Countries that have reported deaths of poultry or wild birds linked to highly pathogenic H5N1 infection. Countries that have reported human cases of highly pathogenic H5N1 infection. The global spread of highly pathogenic H5N1 influenza in birds is considered a significant pandemic threat. While other H5N1 influenza  strains are known, they are significantly different from a current, highly pathogenic H5N1 strain on a genetic level, making the global spread of this new strain unprecedented. The H5N1 strain is a fast-mutating, highly pathogenic avian influenza virus (HPAI) found in multiple bird species. It is both epizootic (an epidemic in non-humans) and panzootic (a disease affecting animals of many species especially over a wide area). Unless otherwise indicated, "H5N1" in this timeline refers to the recent highly pathogenic strain of H5N1. "Since 1997, studies of H5N1 influenza indicate that these viruses continue to evolve, with changes in antigenicity and internal gene constellations; an expanded host range in avian species and the ability to infect felids; enhanced pathogenicity in experimentally infected mice and ferrets, in which they cause systemic infections; and increased environmental stability." The regression curve for deaths is y = a + ek x, and is shown extended through the end of April, 2007. Tens of millions of birds have died of H5N1 influenza and hundreds of millions of birds have been slaughtered and disposed of, to limit the spread of H5N1. Countries that have reported one or more major highly pathogenic H5N1 outbreaks in birds (causing at least thousands but in some cases millions of dead birds) are (in order of first outbreak occurrence): South Korea, Vietnam, Japan, Thailand, Cambodia, Laos, Indonesia, China, Malaysia, Russia, Kazakhstan, Mongolia, Turkey, Romania, Croatia, Ukraine, Cyprus, Iraq, Nigeria, Egypt, India, France, Niger, Bosnia, Azerbaijan, Albania, Cameroon, Myanmar, Afghanistan, Israel, Pakistan, Jordan, Burkina Faso, Germany, Sudan, Ivory Coast, Djibouti, Hungary, United Kingdom, Kuwait, Bangladesh, Saudi Arabia, Ghana, Czech Republic, Togo, Nepal, and Bhutan. Highly pathogenic H5N1 has been found in birds in the wild in numerous other countries: Austria, Bulgaria, Denmark, Greece, Iran, Italy, Poland, Serbia and Montenegro, Slovakia, Slovenia, Spain, Sweden, and Switzerland. Surveillance of H5N1 in humans, poultry, wild birds, cats and other animals remains very weak in many parts of Asia and Africa. Much remains unknown about the exact extent of its spread. H5N1 has low pathogenic varieties endemic in birds in North America. H5N1 has a highly pathogenic variety that is endemic in dozens of species of birds throughout south Asia and parts of Africa. So far, it is very difficult for humans to become infected with H5N1. The presence of highly pathogenic (deadly) H5N1 around the world in both birds in the wild (swans, magpies, ducks, geese, pigeons, eagles, etc.) and in chickens and turkeys on farms has been demonstrated in millions of cases with the virus isolate actually sequenced in hundreds of cases yielding definitive proof of the evolution of this strain of this subtype of the species Influenzavirus A (bird flu virus). As of the July 25, 2008 FAO Avian Influenza Disease Emergency Situation Update, H5N1 pathogenicity is continuing to gradually rise in endemic areas but the avian influenza disease situation in farmed birds is being held in check by vaccination. Eleven outbreaks of H5N1 were reported worldwide in June 2008 in five countries (China, Egypt, Indonesia, Pakistan and Vietnam) compared to 65 outbreaks in June 2006 and 55 in June 2007. The "global HPAI situation can be said to have improved markedly in the first half of 2008 [but] cases of HPAI are still underestimated and underreported in many countries because of limitations in country disease surveillance systems". A highly pathogenic strain of H5N1 caused flu outbreaks with significant spread to numerous farms, resulting in great economic losses in 1959 in Scotland in chickens and in 1991 in England in turkeys. These strains were somewhat similar to the current pathogenic strain of H5N1 in two of its ten genes, the gene that causes it to be type H5 and the gene that causes it to be N1. The other genes can and have been reassorted from other subtypes of the bird flu species (their ease at exchanging genes is part of what makes them all one species). Evolution by reassortment of H5N1 from 1999 to 2002 created the Z genotype which became the dominant strain of highly pathogenic H5N1 in 2004 and is now spreading across the entire world in both wild and domestic birds. "The precursor of the H5N1 influenza virus that spread to humans in 1997 was first detected in Guangdong, China, in 1996, when it caused a moderate number of deaths in geese and attracted very little attention." In 1997, in Hong Kong, 18 humans were infected and 6 died in the first known case of H5N1 infecting humans. On December 28 to 29, 1997, 1.3 million chickens were killed by the government of Hong Kong. The government also suspended the import of chickens from mainland China. In 2003 the first cases in humans since 1997 were diagnosed. Three people in one family were infected after visiting Fujian province in mainland China and 2 died. By midyear of 2003 outbreaks of poultry disease caused by H5N1 occurred in Asia, but were not recognized as such. That December animals in a Thai zoo died after eating infected chicken carcasses. Later that month H5N1 infection was detected in 3 flocks in the Republic of Korea. H5N1 in China in this and later periods is less than fully reported. Blogs have described many discrepancies between official China government announcements concerning H5N1 and what people in China see with their own eyes. Many reports of total H5N1 cases exclude China due to widespread disbelief in China's official numbers. In January 2004 a major new outbreak of H5N1 surfaced in Vietnam and Thailand's poultry industry, and within weeks spread to ten countries and regions in Asia, including Indonesia, South Korea, Japan and China. In October 2004 researchers discovered H5N1 is far more dangerous than previously believed because waterfowl, especially ducks, were directly spreading the highly pathogenic strain of H5N1 to chickens, crows, pigeons, and other birds and that it was increasing its ability to infect mammals as well. From this point on, avian influenza experts increasingly refer to containment as a strategy that can delay but not prevent a future avian flu pandemic. The spread of avian influenza in the eastern hemisphere. In January 2005 an outbreak of avian influenza affected thirty three out of sixty four cities and provinces in Vietnam, leading to the forced killing of nearly 1.2 million poultry. Up to 140 million birds are believed to have died or been killed because of the outbreak. In April 2005 there begins an unprecedented die-off of over 6,000 migratory birds at Qinghai Lake in central China over three months. This strain of H5N1 is the same strain as is spread west by migratory birds over at least the next ten months. In August 2005 H5N1 spread to Kazakhstan, Mongolia and Russia. On September 29, 2005, David Nabarro, the newly appointed Senior United Nations System Coordinator for Avian and Human Influenza, warned the world that an outbreak of avian influenza could kill 5 to 150 million people. David Nabarro later stated that as the virus had spread to migratory birds, an outbreak could start in Africa or the Middle East. Later in 2005 H5N1 spread to Turkey, Romania, Croatia and Kuwait. In the first two months of 2006 H5N1 spread to other Asian countries (such as India), north Africa, and Europe in wild bird populations possibly signaling the beginning of H5N1 being endemic in wild migratory bird populations on multiple continents for decades, permanently changing the way poultry are farmed. By April 2006 scientists had concluded that containment had failed due to the role of wild birds in transmitting the virus and were now emphasizing far more comprehensive risk mitigation and management measures. In June 2006 WHO predicted an upsurge in human deaths due to H5N1 during late 2006 or early 2007 following a summer/fall lull in most countries, as H5N1 appears to be somewhat seasonal in nature. In July and August 2006 significantly increased numbers of bird deaths due to H5N1 were recorded in Cambodia, China, Laos, Nigeria, and Thailand while continuing unabated a rate unparalleled in Indonesia. In June, there was a human outbreak in Indonesia when 8 members of a family in Sumatra became infected and 7 died. The WHO reported that this may have been the first recorded instance of human-to-human transmission. In September, Egypt and Sudan joined the list of nations seeing a resurgence of bird deaths due to H5N1. In November and December, South Korea and Vietnam joined the list of nations seeing a resurgence of bird deaths due to H5N1. In January, Japan, Hungary, Russia, and the United Kingdom joined the list of nations seeing a resurgence of bird deaths due to H5N1. In February, Pakistan, Turkey, Afghanistan, and Myanmar joined the list and Kuwait saw its first major outbreak of H5N1 avian influenza. In March Bangladesh and Saudi Arabia each saw their first major outbreak of H5N1 avian influenza and Ghana in May. As H5N1 continued killing many birds and a few people throughout the spring in countries where it is now endemic, in June Malaysia and Germany saw a resurgence of bird deaths due to H5N1, while the Czech Republic and Togo experienced their first major outbreak of H5N1 avian influenza. In July France and India also saw a resurgence of bird deaths due to H5N1. January 24, 2008: China's health ministry has confirmed a 22-year-old man has died from H5N1 in central Hunan province. February 26, 2008: H5N1 killed a school teacher from northern Vietnam in the country's 51st death from the disease, and health officials fretted that the virus would spread further. February 28, 2008: There are no indications that H5N1 is becoming a bigger problem in China despite the deaths of three people from the disease this year, the World Health Organisation said Wednesday. March 4, 2008: H5N1 virus confirmed as the cause of death for a 25-year-old female from Sennoris District, Fayum Governorate, Egypt. June 7, 2008: Hong Kong found the H5N1 bird flu virus at a poultry stall in Sham Shui Po. 2,700 birds were ordered to be killed by the local government. A new regulation requires all live chickens not sold by 8pm to be killed. The chairman of the Hong Kong Poultry Wholesalers Association said the government's decision makes it very difficult for their business to continue. Retailers who keep live poultry after 8pm are now subject to a fine of HK$50,000 and six months imprisonment. As of the July 25, 2008 FAO Avian Influenza Disease Emergency Situation Update, H5N1 pathogenicity is continuing to gradually rise in wild birds in endemic areas but the avian influenza disease situation in farmed birds is being held in check by vaccination. Eleven outbreaks of H5N1 were reported worldwide in June 2008 in five countries (China, Egypt, Indonesia, Pakistan and Vietnam) compared to 65 outbreaks in June 2006 and 55 in June 2007. The "global HPAI situation can be said to have improved markedly in the first half of 2008 [but] cases of HPAI are still underestimated and underreported in many countries because of limitations in country disease surveillance systems". January 16, 2009: H5N1 hits Nepal for first time. In a January 16 report to the World Organization for Animal Health (OIE), government officials in Nepal said the virus struck backyard poultry in a village in Jhapa district in the southeastern corner of Nepal. Though the Nepal Government announced that bird flu in the country's Kankarbhitta area is under control, avian virus surfaced again in Sharanamati of Jhapa district. Over 150 chickens died in the Indian border town, 35 km southwest of Kankarbhitta. The Ministry of Agriculture and Cooperatives declared the area surrounding Sharanamati a "bird-flu affected area" and increased surveillance along the border. A Rapid Response Team (RRT) was dispatched to control the virus. The government also banned the transportation of poultry products throughout the country. The first outbreak was confirmed in Kankarbhitta on January 16. 28,000 chickens were killed in the area to control the virus. Earlier, Agriculture Minister Jayprakash Gupta asked the international community and donor agencies to provide help to Nepal fight the disease. The Indo-Nepal border was in heightened alert because of the disease. February 21, 2009: H5N1 killed a 23-year-old woman named Lý Tài Múi from Nà Cáng, Quảng An, Đầm hà, Quảng Ninh Province, Vietnam. February 25, 2009: H5N1 virus confirmed as the cause of death for a 32-year-old man from Quảng Bình Province, Vietnam. March 19, 2009: H5N1 virus confirmed as the cause of death for a 3-year-old boy from Đồng Tháp Province, Vietnam. March 21, 2009: State media reported H5N1 might be the cause of a death of a female in Bạc Liêu, Vietnam. April 24, 2009: H5N1 virus confirmed as the cause of death for a 23-year-old woman from Thanh Hóa, Vietnam. July 1, 2009: Three cases of H5N1 were confirmed in Egypt, all three of whom recovered. February 22, 2010: First case of H5N1 in birds confirmed in Bhutan in the district of Chhukha. June 16, 2011: Five cases of H5N1 were confirmed in Egypt, three of which were fatal. December 20, 2011: Details of research on H5N1 on mutations which enable its transmission to ferrets —the standard mammalian model for influenza research— are requested by the U.S. National Security Advisory Board for Biotechnology (NSABB) to be redacted due to concerns over bioterrorism potential. February 7, 2012: H5N1 is discovered again in crows in Kathmandu Valley, Nepal. February 17, 2012: WHO decides in a two-day meeting held in Geneva, Switzerland that additional analysis of public health and security risks is needed to determine whether research on man-made H5N1 virus capable of aerosol transmission between mammals (ferrets) should be released in full. May 26, 2012: A 10-year-old girl is to said to have died in the southwestern Kampong Speu province, Cambodia. According to the WHO in a joint statement with the Cambodian health ministry, the girl had developed shortness of breath and a fever on May 20 and died on Sunday May 27. January 3, 2014: An Alberta, Canada resident dies of H5N1 after returning from Beijing, China and feeling unwell on a return flight from Beijing to Vancouver (Air Canada 030) and Vancouver to Edmonton (Air Canada 244) on December 27, 2013 and hospitalized on January 1, 2014; this is the first case in Canada and North America. Pigs can harbor influenza viruses adapted to humans and others that are adapted to birds, allowing the viruses to exchange genes and create a pandemic strain. Avian influenza virus H3N2 is endemic in pigs ("swine flu") in China and has been detected in pigs in Vietnam, increasing fears of the emergence of new variant strains. Health experts say pigs can carry human influenza viruses, which can combine (i.e. exchange homologous genome sub-units by genetic reassortment) with H5N1, passing genes and mutating into a form which can pass easily among humans. H3N2 evolved from H2N2 by antigenic shift and caused the Hong Kong Flu pandemic of 1968 and 1969 that killed up to 750,000 humans. The dominant strain of annual flu in humans in January 2006 is H3N2. Measured resistance to the standard antiviral drugs amantadine and rimantadine in H3N2 in humans has increased to 91% in 2005. A combination of these two subtypes of the species known as the avian influenza virus in a country like China is a worst-case scenario. In August 2004, researchers in China found H5N1 in pigs. In 2005, it was discovered that H5N1 "could be infecting up to half of the pig population in some areas of Indonesia, but without causing symptoms [...] Chairul Nidom, a virologist at Airlangga University's tropical disease center in Surabaya, Java, was conducting independent research earlier this year. He tested the blood of 10 apparently healthy pigs housed near poultry farms in western Java where avian flu had broken out, Nature reported. Five of the pig samples contained the H5N1 virus. The Indonesian government has since found similar results in the same region, Nature reported. Additional tests of 150 pigs outside the area were negative." Domestic cats can get H5N1 from eating birds, and can transmit it to other cats and possibly to people. "In Bangkok, Thailand, all the cats in one household are known to have died of H5N1 in 2004. Tigers and leopards in Thai zoos also died, while in 2007 two cats near an outbreak in poultry and people in Iraq were confirmed to have died of H5N1, as were three German cats that ate wild birds. In Austria, cats were infected but remained healthy". Cats in Indonesia were also found to have been infected with H5N1. The spread to more and more types and populations of birds and the ability of felidae (cats) to catch H5N1 from eating this natural prey means the creation of a reservoir for H5N1 in cats where the virus can adapt to mammals is one of the many possible pathways to a pandemic. Variants have been found in a number of domestic cats, leopards, and tigers in Thailand, with high lethality. "The Thailand Zoo tiger outbreak killed more than 140 tigers, causing health officials to make the decision to cull all the sick tigers in an effort to stop the zoo from becoming a reservoir for H5N1 influenza. A study of domestic cats showed H5N1 virus infection by ingestion of infected poultry and also by contact with other infected cats (Kuiken et al., 2004)." The initial OIE report reads: "the clinical manifestations began on 11 October 2004 with weakness, lethargy, respiratory distress, and high fever (about 41-42 degrees Celsius). There was no response to any antibiotic treatment. Death occurred within three days following the onset of clinical signs with severe pulmonary lesions." A dead cat infected with the H5N1 bird flu virus was found in Germany. 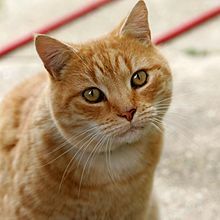 It was announced in the August 2006 CDC EID journal that while literature describing HPAI H5N1 infection in cats had been limited to a subset of clade I viruses; a Qinghai-like virus (they are genetically distinct from other clade II viruses) killed up to five cats and 51 chickens from February 3 to 5, 2006 in Grd Jotyar (~10 km north of Erbil City, Iraq). Two of the cats were available for examination. "An influenza A H5 virus was present in multiple organs in all species from the outbreak site in Grd Jotyar (Table). cDNA for sequencing was amplified directly from RNA extracts from pathologic materials without virus isolation. On the basis of sequence analysis of the full HA1 gene and 219 amino acids of the HA2 gene, the viruses from the goose and 1 cat from Grd Jotyar and from the person who died from Sarcapcarn (sequence derived from PCR amplification from first-passage egg material) are >99% identical at the nucleotide and amino acid levels (GenBank nos. DQ435200–02). Thus, no indication of virus adaptation to cats was found. The viruses from Iraq are most closely related to currently circulating Qinghai-like viruses, but when compared with A/bar-headed goose/Qinghai/65/2005 (H5N1) (GenBank no. DQ095622), they share only 97.4% identity at the nucleic acid level with 3 amino acid substitutions of unknown significance. On the other hand, the virus from the cat is only 93.4% identical to A/tiger/Thailand/CU-T4/2004(H5N1) (GenBank no. AY972539). These results are not surprising, given that these strains are representative of different clades (8,9). Sequencing of 1,349 bp of the N gene from cat 1 and the goose (to be submitted to GenBank) show identity at the amino acid level, and that the N genes of viruses infecting the cat and goose are >99% identical to that of A/bar-headed goose/Qinghai/65/2005(H5N1). These findings support the notion that cats may be broadly susceptible to circulating H5N1 viruses and thus may play a role in reassortment, antigenic drift, and transmission." "Chairul Anwar Nidom of Airlangga University in Surabaya, Indonesia, told journalists last week that he had taken blood samples from 500 stray cats near poultry markets in four areas of Java, including the capital, Jakarta, and one area in Sumatra, all of which have recently had outbreaks of H5N1 in poultry and people. Of these cats, 20% carried antibodies to H5N1. This does not mean that they were still carrying the virus, only that they had been infected - probably through eating birds that had H5N1. Many other cats that were infected are likely to have died from the resulting illness, so many more than 20% of the original cat populations may have acquired H5N1." Martens and an unknown number of other mammals can catch H5N1, illustrating the unprecedented ability of H5N1 to survive and spread. H5N1 has been transmitted in laboratories to many species including mice and ferrets to study its effects. A purposely mutated strain  in ferrets has engendered a notable international policy debate regarding the openness of scientific research, the mandates of public health, and the potential for bioterrorism. H5N1 was transmitted in the wild to three civet cats in Vietnam in August 2005 and a stone marten in Germany in March 2006. The BBC reported that a stray dog in Azerbaijan died from the disease on March 15, 2006. People living in areas where the A(H5N1) virus has infected birds are advised to keep their cats indoors. "Cats can be infected through the respiratory tract. Cats can also be infected when they ingest the virus, which is a novel route for influenza transmission in mammals. But cats excrete only one-thousandth the amount of virus that chickens do [...] The concern is that if large numbers of felines and other carnivores become infected, the virus might mutate in a series of events that could lead to an epidemic among humans. Dogs, foxes, seals, and other carnivores may be vulnerable to A(H5N1) virus infection, Dr. Osterhaus said. Tests in Thailand have shown that the virus has infected dogs without causing apparent symptoms." H5N1 has the potential to infect cattle. Asymptomatic shedding of H5N1 by infected calves and subsequent seroconversion is possible. Bird-to-calf transmission resulting in seroconversion is probable. While the incidence of clinical infections of cattle with H5N1 in H5N1 endemic regions should be low, "serum from bovine species would be a valuable source of additional information about transmission events, especially in regions like Asia and Egypt, where HPAIV (H5N1) is endemic and probability of contact between poultry and cattle is high." ^ WHO; Farrar, J; Han, AM; Hayden, FG; Hyer, R; De Jong, MD; Lochindarat, S; Nguyen, TK; et al. (September 29, 2005). "Avian Influenza A (H5N1) Infection in Humans". NEJM. 353 (13): 1374–85. CiteSeerX 10.1.1.730.7890. doi:10.1056/NEJMra052211. PMID 16192482. ^ Robert G. Webster; Elena A. Govorkova, M.D. (November 23, 2006). "H5N1 Influenza — Continuing Evolution and Spread". NEJM. 355 (21): 2174–2177. doi:10.1056/NEJMp068205. PMID 17124014. ^ a b "July 25, 2008 FAO Avian Influenza Disease Emergency Situation Update" (PDF). ^ WHO (March 2, 2004). "Situation (poultry) in Asia: need for a long-term response, comparison with previous outbreaks". Disease Outbreak News: Avian Influenza A(H5N1). 31. ^ Robert G. Webster; Malik Peiris; Honglin Chen; Yi Guan (January 2006). "H5N1 Outbreaks and Enzootic Influenza". Emerging Infectious Diseases. 12 (1): 3–8. doi:10.3201/eid1201.051024. PMC 3291402. PMID 16494709. ^ a b c WHO (October 28, 2005). "H5N1 avian influenza: timeline" (PDF). Archived from the original (PDF) on November 29, 2005. ^ J.S. Peiris; W.C Yu; C.W. Leung; C.Y. Cheung; W.F. Ng; J.M. Nicholls; T.K. Ng; K.H. Chan; S.T. Lai; W.L. Lim; K.Y. Yuen; Y. Guan (February 21, 2004). "Re-emergence of fatal human influenza A subtype H5N1 disease". Lancet. 363 (9409): 617–9. doi:10.1016/S0140-6736(04)15595-5. PMID 14987888. ^ WHO. "Confirmed Human Cases of Avian Influenza A(H5N1)". Archived from the original on April 23, 2006. ^ WHO (January 19, 2006). "Confirmed Human Cases of Avian Influenza A(H5N1)". Archived from the original on February 13, 2006. ^ Branswell, Helen (June 21, 2006). "China had bird flu case two years earlier than Beijing admits: researchers". CBC News. ^ WHO (February 27, 2003). "Influenza A(H5N1) in Hong Kong Special Administrative Region of China". Disease Outbreak News: Avian Influenza A(H5N1). 2. ^ WHO. "Chronology of a serial killer". Disease Outbreak News: SARS. 95. ^ International Institute for Sustainable Development (IISD) (April 14, 2006). "Scientific Seminar on Avian Influenza, the Environment and Migratory Birds". Avian Influenza & Wild Birds Bulletin. 123 (1). ^ "CDC - NIOSH Publications and Products - Protecting Poultry Workers from Avian Influenza (Bird Flu) (2008-128)". www.cdc.gov. Retrieved July 31, 2015. ^ "China Says 22-Year Old Died of Bird Flu". Voice of America. February 18, 2008. Retrieved February 18, 2008. ^ "Bird flu kills woman in Vietnam". CNN. February 25, 2008. Archived from the original on February 27, 2008. Retrieved February 26, 2008. ^ "WHO plays down bird flu threat in China after three human deaths". AFP-Google. February 27, 2008. Retrieved February 28, 2008. ^ "Avian influenza - situation in Egypt - update 5". WHO. ^ "Hong Kong finds H5N1 bird flu in poultry market". Reuters. June 7, 2008. ^ Thestandard.hk. "Thestandard.hk." Business brisk at chicken stalls. Retrieved on July 4, 2008. ^ Thestandard.hk. "Thestandard.hk." Legal threat in live-chicken battle. Retrieved on July 4, 2008. ^ Nepal News.Net (2009). "Bird Flu Strikes Nepal". NepalNews. ^ P. Nam (2009). "Bệnh nhân H5N1 ở Quảng Ninh tử vong". VNExpress. Retrieved April 27, 2009. ^ "Thêm ca tử vong vì cúm gia cầm" (in Vietnamese). BBC Vietnamese. Retrieved April 27, 2009. ^ Hòa, Thu (2009). "Bệnh nhân 3 tuổi nhiễm H5N1 đã tử vong" (in Vietnamese). Viet Nam Net. Retrieved April 27, 2009. ^ "Một bệnh nhân tử vong nghi nhiễm cúm gia cầm" (in Vietnamese). Voice of Vietnam. Retrieved April 27, 2009. ^ VNA (2009). "Bird flu kills Thanh Hoa woman: official". Thanh Niên. Archived from the original on July 9, 2009. Retrieved April 27, 2009. ^ "WHO | Avian influenza - situation in Egypt - update 20". www.who.int. Retrieved December 1, 2016. ^ "FAO sees signs of decline in H5N1 outbreaks". CIDRAP. Retrieved December 1, 2016. ^ "Egypt reports 5 H5N1 infections, 3 fatal". CIDRAP. Retrieved December 1, 2016. ^ a b "NSABB: Studies show how H5N1 can jump natural barrier". CIDRAP. Retrieved December 1, 2016. ^ "Bird flu: Research row as US raises terror fears". BBC News. December 21, 2011. ^ "You searched for Govt eats crow on bird flu denial - The Himalayan Times". The Himalayan Times. Retrieved December 1, 2016. ^ a b "Experts delay call on releasing controversial H5N1 work". BBC News. February 17, 2012. ^ "Cambodian girl, 10, dies from bird flu: WHO". Google News Article. May 28, 2012. ^ "Speaking Notes – Deputy Chief Public Health Officer - H5N1 Technical Briefing". Public Health Agency of Canada. January 8, 2014. Retrieved January 21, 2014. ^ CDCHAN-00360 (January 15, 2014). "Human Infection with Avian Influenza A (H5N1) Virus". CDC. Retrieved January 21, 2014. ^ "First N America H5N1 bird flu death confirmed in Canada". BBC News. January 8, 2014. Retrieved December 1, 2016. ^ Weisberg, Nicole (January 9, 2014). "WHO releases more details about H5N1 victim". CTV Edmonton. Retrieved January 9, 2014. ^ T. Tiensin; P. Chaitaweesub; T. Songserm; A. Chaisingh; W. Hoonsuwan; C. Buranathai; T. Parakamawongsa; S. Premashthira; A. Amonsin; M. Gilbert; M. Nielen; A. Stegeman (November 2005). "Highly pathogenic avian influenza H5N1, Thailand, 2004". Emerg Infect Dis. 11 (11): 1664–72. doi:10.3201/eid1111.050608. PMC 3367332. PMID 16318716. ^ Henry L Niman (October 19, 2004). "Bird Flu May Have Killed Thai Tigers". ProMED mail. Retrieved February 19, 2008. ^ Henry L Niman (October 22, 2004). "Thailand: Up to 100 Tigers in Sri Racha Zoo Now Affected by Avian Influenza". Retrieved February 19, 2008. ^ Board on Global Health (BGH) (2005). The Threat of Pandemic Influenza: Are We Ready? Workshop Summary. NAP. p. 15. ^ Fares Bakhit Naser (April 13, 2006). "Avian Influenza in Jordan: Followup Report No. 2". OIE. Retrieved October 8, 2006. ^ "German cat gets deadly bird flu". BBC News. February 28, 2006. Retrieved October 8, 2006. ^ "Austrian Cats Test Positive for Bird Flu". ABC News. March 6, 2006. Archived from the original on October 26, 2006. Retrieved October 8, 2006. ^ Butler, Declan (2012). "UPDATED: Avian flu controversy comes to roost at WHO". Nature. doi:10.1038/nature.2012.10055. ^ "Bird flu kills Vietnam civet cats". BBC News. August 26, 2005. Retrieved October 7, 2006. ^ "Bird flu 'causes first dog death'". BBC News. March 15, 2006. Retrieved October 8, 2006. ^ Emerg Infect Dis article Experimental Infection of Cattle with Highly Pathogenic Avian Influenza Virus (H5N1) published July 2008 - Suggested Citation for this Article: "Kalthoff D, Hoffmann B, Harder T, Durban M, Beer M. Experimental infection of cattle with highly pathogenic avian influenza virus (H5N1). Emerg Infect Dis [serial on the Internet]. 2008 July [date cited]. Available from https://www.cdc.gov/EID/content/14/7/1132.htm doi:10.3201/eid1407.071468"
This page was last edited on 30 August 2018, at 00:05 (UTC).